There's nothing wrong with Presidio that couldn't be fixed by several weeks of precision air strikes. edit: I take it back and offer my apologies , this turned out to be a pretty good thread. Peace, out. I like Presidio - great grocery store there and a fantastic Mexican restaurant. Good place to get tires fixed as well. Reminds me of the old west. There's nothing wrong with Presidio that couldn't be fixed by several days of precision air strikes. You've been registered here since 2007 and this is your first post? Speaking of Presidio, did the railroad line between Alpine and Presidio ever get placed back in service? When I was there in 2006, I by chance struck up a conversation with the head of US Customs while in line at the local cafe to pay my check. He mentioned they were gearing up at the time for the reactivation of the rails to handle inspections of produce trains from the Mexican interior. Este chavo, si sabe......I like your history Juan. Very cultured. Yep. Eaten at the Mexican food restaurant (on the right as you are heading out to Marfa). The gas station (Beaza's) was a good place to stop as well for some groceries and fuel. Who knows, maybe I'll retire to the Presidio area? I always get excited when I get to the outskirts of Presidio going down Hwy 67. It just has a "feeling". The layout of the town is very cool too, with the 90 degree turns, the old buildings, gravel streets, cinder-block homes, etc. Plus, the High School looks good too - home of the Blue Devils if I recall correctly. Yes, they even have football is Presidio! Or course, no visit to the region is complete w/o a stop at ole Ben Leatons place. I'd like to have a fort like him with that massive court yard for having a big BBQ. It certainly can be damn hot out that way in the summer - damn hot. I always expect to see John Wayne riding in on his horse. I saw the Burrow Lady many years ago encamped along the roadway - God Rest her Soul. Plus, there is that neat "trolly" going across the Rio Grande just outside of town on Ranch Road 170 - never have figured out what that is all about. 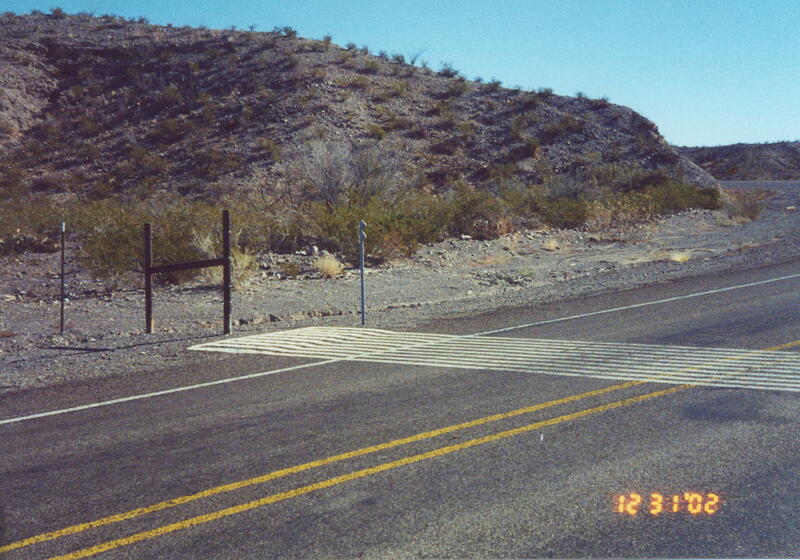 Then, if you are very very observant and remember well, there are the painted cattle guards in the road - I guess they work. Only place I have ever seen painted stripes for cattle guards. Cool - now I know - if I can remember. Should be a tourist trap and offer "rides" across for two bits. We're very fond of Presidio as well. We usually drive Pinto Canyon Road down from Marfa and head over to El Patio in Presidio for some of the best mexican food we've found. I know the feeling of which Shanea speaks, southern Presidio County is a very cool and underappreciated part of the world. Once upon a time, long, long ago, we smelled gasoline while cruising south on Hwy 67 late one Saturday night. The truck was still running but the fuel pump diaphragm had developed a small pin hole and was pumping gas out of its weep hole. With fingers crossed we limped our way to the Three Palms Inn for the night. The next morning at breakfast we asked our waitress if there was an auto parts store in town that was open today. No senor, not on Sunday… but if you like I can call my uncle and he will come open it for you. Good folks in Presidio, TX.